The Modenzi D-U Armchair is an espresso brown, resin wicker chair with thick cushions in bright colors. You can easily find the color that will match the rest of the furniture you have in your backyard. This single armchair can be integrated into the patio set you already have. The brown wicker is a lovely material that is routinely used in outdoor furniture. You should be able to easily fit this into your current set. The brown wicker design on the outside of the frame is a lovely shade that will match your other outdoor furniture. 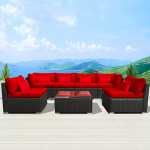 You can purchase your furniture in sets as needed from Modenzi, but there are also other furniture manufacturers who make this same kind of wicker. 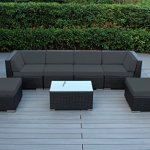 If you’ve purchased outdoor conversation sets but need more pieces added, this is perfect. You don’t have to order an entirely new set. All you have to do is purchase the pieces that you absolutely need. Like an armchair. The wicker design is crafted from resin. The resin used in this armchair as well as other pieces by Modenzi will last for years. It’s meant to be durable and easy to clean season after season. For most cleaning, all you need to do is remove the cushions and hose down the resin. It’ll remove dust and dirt. For times when the resin needs a more thorough cleaning, you can use a wide scrub brush and a solution of vinegar and water. You won’t have to scrub. Just brush the solution over the resin wicker to get between the weaving. Hose it down after that. The resin is meant to be fade proof as well as easy to clean. You could leave this furniture out in the sun for years, and it’ll still be the same deep, rich brown as the day it was purchased. Under the sturdy resin, there’s an even sturdier frame. The aluminum metal has a powder coating. The powder coating is fused with the aluminum to ensure that it’ll keep the metal protected. Over time, paint can begin to peel as it’s exposed to the elements. That won’t happen with powder coating. In the frame, you’re getting a lovely espresso brown that will match other furniture in your collection of outdoor pieces. The 4” cushions come in different colors. There’s a deep red, vibrant orange, bright turquoise as well as neutrals like beige and dark beige. Any of those colors should match what you already have in your backyard. The armchair can be easily integrated into your modular furniture set, too. These cushions are easily washed. They have zippered covers that can be removed and tossed into the washer. While the material is durable and the colors won’t fade, it might make sense to remove the cushions sometimes. It’ll extend their life. The light aluminum frame means that the armchair is easy to move. If you decide that it doesn’t make sense in the original spot you chose, simply shift it to a new spot. You don’t want to break your back changing the configuration of your furniture, and with this armchair, you don’t need to worry about that. It’ll slide right into a new configuration. At some point, you might even forget that you purchased that armchair separately. The armchair measures 31.5 inches in length by 31.5 inches in width by 24.5 inches high. It comes partially assembled, so all you have to do is attach the arms, seat, and back to the frame. The instructions should give you all the information you could possibly need. It won’t take your entire family and all the tools in your toolbox to assemble this armchair. It will be easy to add this to your current furniture set. How much does this chair weigh for shipping? The shipping weight of this chair is 31 pounds. Can extra cushions be purchased for this chair as well as other Modenzi furniture? They can. Contact the manufacturer to have the cushions delivered to your home. There’s a 90 day warranty on the frame itself. Though, you shouldn’t have a problem with their aluminum, powder-coated frame at all. The Modenzi D-U Armchair is a chair that can be purchased separately from other conversation sets available from this manufacturer. At the same time, it’s an armchair that fits seamlessly into a grouping of other types of furniture. You might have a brown wicker outdoor set that needs a chair or two. This is a perfect way to get that extra chair without having to buy all the other pieces that you don’t need.